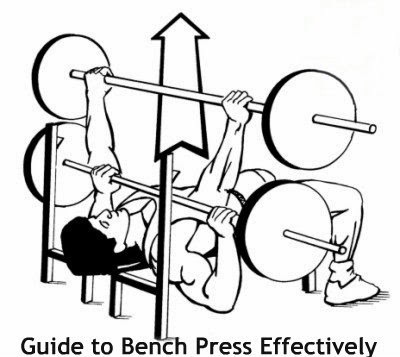 Bench press is certainly the most common exercise that is being worked out at the gyms and many people don’t do it effectively and some are unaware of its important techniques during workouts. So I am here to provide you with some effective that helps you increase your bench workouts now. The beginning point of any bench rep starts with the grip over the bar. If your grip is wider and use chest to expend and push the energy outwards, or too narrow triceps and push the energy inwards, you will be doing it wrong. The perfect grip is to incorporate both the muscle groups but, favoring at the point where you feel stronger and giving all the power to make it straight up. Now it’s the time to add some weights to your bar. Again, lie on the bench, by having the strut not too closer or far away and make sure it is placed at the right position. Plan to place your foot on the floor firmly and bend your keens approximately to some 80 degrees. Keep your feet flat on the floor so that you can feel stable. Some bench press athletes who curve up their tip toes while working out, however, I advise you to hold on the way whichever keeps you stable. Keep the bar into the struts and raise your glute and get up. Squeeze and massage your shoulders together and give a long breath out. Get back your shoulder back to the bench and lock into the position. Lower your bum back on to the bench and compress your glutes. I hope you will now know to keep your body tight throughout the body and feel locked while doing workouts as it gives you a secure feeling!